Somehow the first box plot doesn’t look like an agregate of the second box plot. Most notable in the social aspects. The lower bar for the combined sets is lower than the lower bar of either set.Though my experience with statistics tells me that this doesn’t necessarily mean there’s an error. 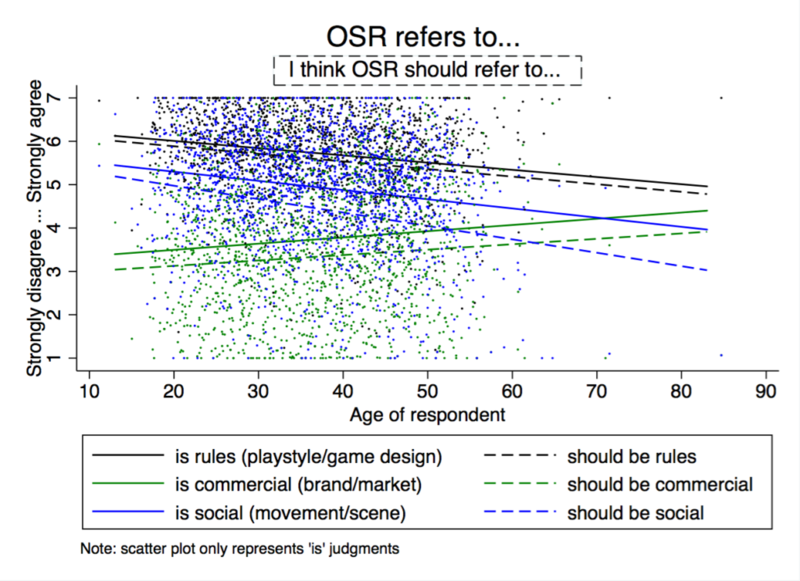 I find it very interesting that older respondents see the commercial aspect more strongly.Though of course the trend line only goes from 3.5 for 20 year olds to 4 for 60 year olds. Not sure if that means much. One of my suspicions is that older people tend to have different experiences and approaches to social media interactions than the younger ones, which leads to a lower emphasis on the social aspects. Whether younger people have a stronger tendency to be interested in design innovation and older people are more set in their ways, I don’t know. But staticians should know whether that’s a general trend throughout the whole population. 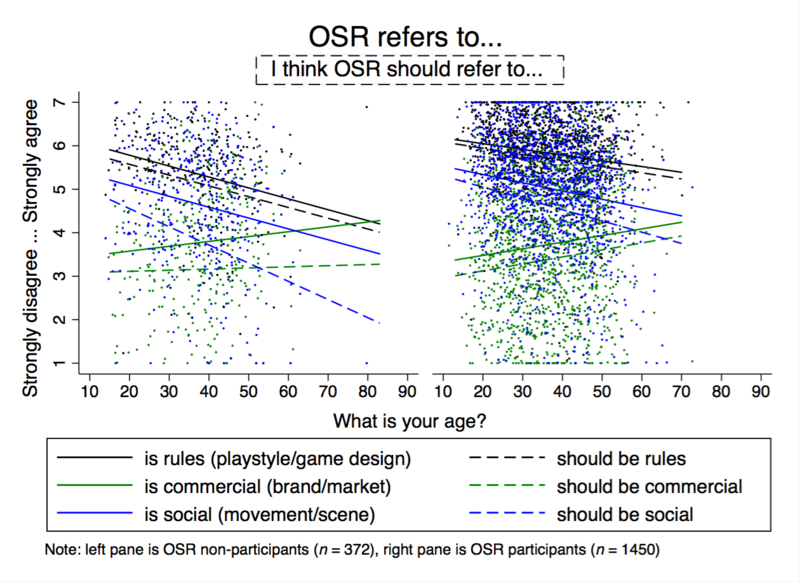 One guess about the social aspect is that older participants may react more negatively to the fractious social media component of the OSR (“drama”) than younger people who experience all social media spaces as subject to these dynamics. I will be curious to see how social media participation in talking about tabletop RPGs varies by platform or frequency for participants of different ages. Also, the frequency of mentioning drama in any of the free-response questions. To be honest, I think the initial survey may have missed an important possibility. The answer to the question of “What is OSR?” might have rightly included “A reactionary political movement within the RPG Community aimed against the Story-Game Indie Revolution”. My impression has been that this is the original source of the OSR as a Movement. And it may be, by missing this option, one might not be able to draw entirely accurate conclusions about its true meaning, relevance and trajectory. I’m not sure about this, of course, as I’m a bit of a late-comer to the scene (having poked my head up out of my hole in 2006, more or less), but that’s been my impression all along. Please feel free to ignore this point if I’m wrong, or better yet, correct me. I’d be curious to hear other views on this. Honestly, vbwyrde I think most people in the OSR had never even heard of story games until they were well into the scene. This is certainly true of me. Also true of many people who later got into a lot of fruitless fights with story game folks. I have met a number of people who discovered OSR through the indie/story games scene, several of which I have gamed with in person. There are several natural channels that people might follow, such as Apocalypse World ⟶ Dungeon World ⟶ OSR or Burning Wheel ⟶ Torchbearer ⟶ OSR. Ron Edwards published several articles in Fight On! And so forth. This seems to be pretty much entirely incorrect. 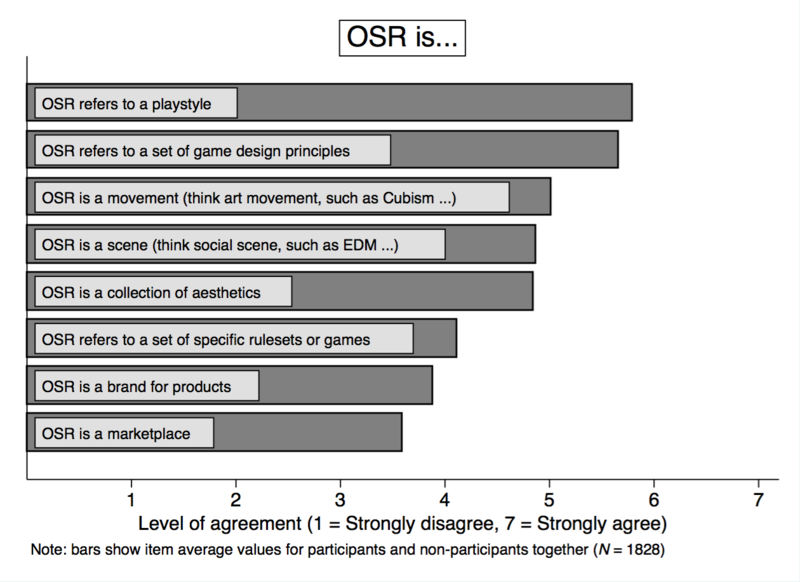 The start of the OSR as a movement can basically be pinpointed as a negative reaction to 3rd edition D&D (and it’s subsequent developments in 3.5, 4e, 5e). If the OSR is ‘against’ anything, it’s WotC’s take on traditional D&D and the style of games strongly influenced by that. I’d also suggest that phrasing it as ‘a reactionary political movement’ is unnecessarily confrontational. It sounds like you have an axe to grind. My experience has also been that reaction was primarily against 3E and 4E D&D. 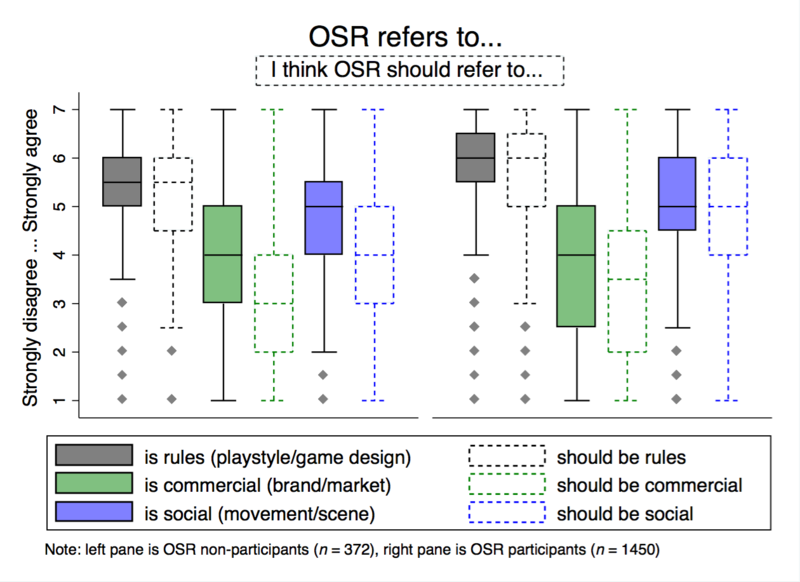 Emmy, an informal (130 respondent) survey I did back in June 2009 timeframe bore that out to some degree, at least within a small audience within the OSR blogosphere. Unfortunately, when I purged my blog in shutting it down back in 2011, that was one of the posts I deleted. I did save an archive of the relevant posts. That seems like historical question. 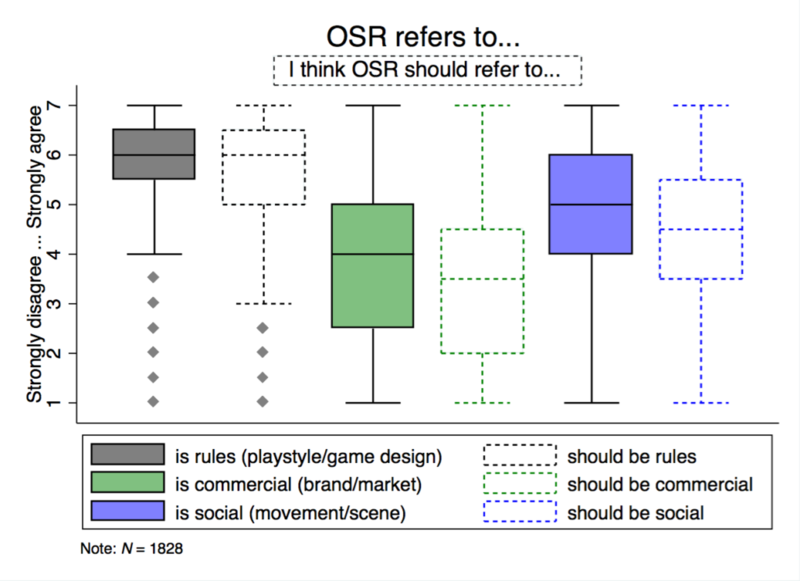 The history of the term might be different from what meaning people attach to OSR now. I am even more of a latecomer (you can see my discovery and trajectory almost entirely in the chronology of this blog, which I started shortly after finding OSR conversations online in 2011). You can see some of that info in the participation post, including total sample size and where the participant heard about the survey. Ben and I shared links to the survey on the big social media platforms with which we interact and several forums that seemed relevant. Let me know if there are other particular details you think would be informative and I’ll try to include them in a future post. 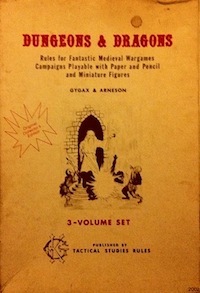 As I recall, the OSR began as a “back to the roots” thing in reaction to first and foremost D&D 3e/3.5e. It was also about going back to using older versions of the game as well as the original gaming style. The clones/simulacra and finally what is now known as the OSR came after that. Also, interesting post and nice to see someone using science to investigate gaming. All relationships in this post are significant (p < .001). This is not terribly informative, however, given the large sample size. The effect size conveys more information. In this context, the effect size is the regression coefficient, which you can see graphically as the slope of the lines. Horizontal, flat lines would mean zero effect. Lines with steeper slope represent stronger associations. The r-squared values are indeed relatively low, as age only explains a small amount of the variance in the aspect scores (I think the values are around 3% though I will have to go back to the analysis to check that). You can also see this visually in the slopes. Taking the commercial aspect as an example, the prediction for age = 20 is around 3.5 while the prediction for age = 60 is around 4 (across all responses). So 40 years shifts the prediction by only half a scale point. The distributions approach normal, though the rules-related aspect has some skew. I will post histograms when I get a chance. As a side note, most researchers avoid plotting the actual data along with model results. They just plot summary statistics (like means by group) or some visual approximation of their model predictions. This is due to both limited space and to serve a rhetorical end. Happily, on my blog I can be as complete as I want. I think of the relationship between age and endorsement presented above more as an argument for the coherence of the three underlying aspects than as a complete explanation for the variation in the aspects. The factor analysis itself is entirely based on covariation within the meaning questions, but that is difficult to show graphically without some other relationship. I should maybe add some of the numbers for goodness of fit. A multidimensional scaling plot is perhaps a better bet, but I suspect most readers would be less familiar with interpreting such a figure and tbh the number of questions is really too small for a good visualization, probably. I might play around with MDS here when I get a chance, but I suspect a post presenting such a figure would need to spend most of the words explaining how to think about a multidimensional scaling plot generally speaking.